Nonfarm Private Payrolls came at 161K vs. 185K consensus. Average Hourly Earnings increased by 0.2% vs. 0.3% consensus. In our analysis, both of these numbers coming below the consensus is good news for the stock market. Those with less experience may think that weaker jobs numbers are bad news. Markets are complex. A big influence on the market is Fed policy. Based on these weaker numbers, Fed is likely to be less aggressive in raising interest rates and that is positive for the stock market. Yesterday at one point the stock market was down 800 Dow Jones points. Many gurus were panicking and got out of the market at the lows. In a dramatic reversal, the market recovered and Nasdaq even went positive. 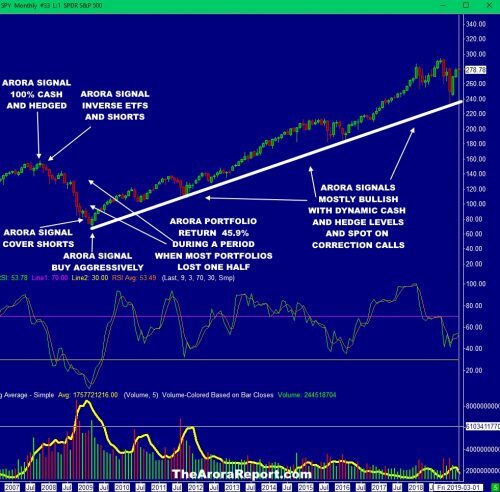 This is another demonstration in real time like hundreds of prior demonstrations that there is significant merit to following The Arora Report system. The momo crowd got really burned yesterday. They were not only selling but short selling aggressively when DJIA was down 800 points. Then the market almost fully recovered. In a rarity, the momo crowd is inactive this morning. Perhaps licking their wounds. The smart money was lightly buying near the lows yesterday but then stopped buying when the market recovered. This morning the smart money is inactive. 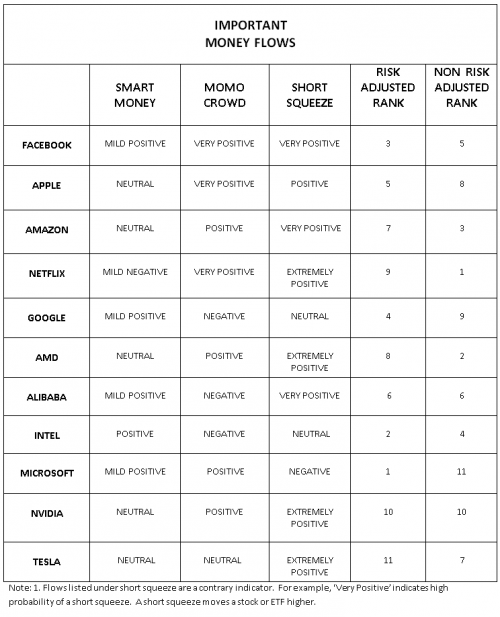 It will significantly help investors to note how smart money acts. If you have been following the Morning Capsule, you would have noticed that smart money often tends to buy extreme weakness and sell extreme strength. Gold is gaining on weaker jobs report. The reason is that gold does not like high interest rates. The weaker jobs report means the Fed may be less aggressive at raising rates. There is potentially good news on oil. There are rumors that OPEC may agree to cut 1.2 million barrels. If true, oil should jump. Is foresight better than hindsight? What is the value to investors of spot on calls? On September 10, 2018, The Arora Report predicted that big tobacco such as Altria (MO) would soon get into marijuana. Subsequently MO denied that they were interested in marijuana. In spite of the denial, The Arora Report persisted in its call and now like thousands of our other calls, this call has come true. On December 3rd, ZYX Buy made a highly timely call to buy CRON saying that MO may invest in it. Four days later the big tobacco company MO is making a major investment in CRON producing nice gains for ZYX Buy subscribers. Not only we called the overall trend right, we also picked the right companies and bought at the right time without incurring losses that are so common in marijuana. Gold futures are at $1249, silver futures are at $14.60, and oil futures are $52.66. S&P 500 resistance levels are 2700, 2740 and 2765; support levels are 2661, 2658 and 2631. Two unexpected events may create opportunities but also potentially higher risks. The two events are the arrest of Huawei’s CFO and the outcome of the OPEC meeting. Huawei is a Chinese telecommunication equipment giant. Meng Wanzhou is the CFO of the company. She is not a run of the mill corporate executive. She is the daughter of the founder and apparently very well connected to the highest government circles in China. Some even call her Chinese royalty. Canada has arrested her on a request from the U. S. The U. S. wants her to be extradited to New York in connection with Huawei violating U. S. sanctions against Iran. She was arrested on December 1. It is not known what Trump knew when he was making positive statements about trade with China. 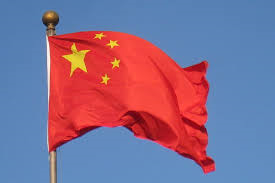 The Chinese are going to see this as U. S. attempt to keep China down. In our analysis, both sides are likely to ringfence this incident and move on with trade negotiations. The market is falling on this incident but can recover if there is positive news on the trade front. On the other hand if the incident is not ringfenced, there may be more selling. There are rumors that there may be no agreement in the OPEC meeting or the production cut may be smaller than the consensus. If these rumors turn out to be true, this may benefit some sectors of the market but may adversely effect other sectors. Anytime something happens that is different from the consensus it generates both opportunity and risk. Initial Jobless Claims came at 231K vs. 225K consensus. This is a leading indicator and continues to bode well for the U. S. economy and the stock market. The momo crowd is aggressively selling stocks in the early trade. Smart money is mostly inactive but selectively buying. Monty is flowing into gold out of stocks. The momo crowd behavior is shifting in the early trade. Lately the usual behavior has been momo crowd money flows to be positive in marijuana and smart money flows to be negative. In the shift, momo crowd is aggressively selling marijuana stocks in the early trade but smart money is no longer selling. Please also see Technical Patterns section below. Marijuana stocks are tracing a top triangle. This is bearish. ETF of interest is MJ. Our very, very short-term early stock market indicator is negative but can easily swing positive based on news and rumors. Bonds are moving higher and interest rates are moving down as the money is flowing out of stocks and into bonds. Gold futures are at $1242, silver futures are at $14.43, and oil futures are $51.07. S&P 500 resistance levels are 2688, 2700 and 2740; support levels are 2658, 2631 and 2615. DJIA futures are down 422 points. Many consider an inverted yield curve a ‘harbinger of doom.’ In plain English, an inverted yield curve means that interest rates on short term instruments are higher than the long term instruments. In normal times, yield on long term instruments is higher than short term instruments. The reason is that an investor takes more risk when investing for the longer term and thus needs to be compensated for the higher risk with the higher yield. The standard benchmark is the difference in yields between two-year Treasuries and 10-year Treasuries and this curve has not inverted. However the yield curve between five-year and three-year Treasuries has become unexpectedly inverted. An inverted yield curve often forecasts a recession. In our analysis, the inversion is most likely related to year end transactions and is not immediately forecasting a recession. Gold continues its run up as the momo crowd aggressively buys. Oil is seeing buying ahead of the OPEC meeting. Big tobacco potentially getting into marijuana is causing excitement. Gold futures are at $1244, silver futures are at $14.70, and oil futures are $53.26. DJIA futures are down 96 points. In 1880’s, a partner dance called tango originated around Argentina. Now President Trump and President Xi orchestrated a successful tango in Argentina calling for a temporary truce in the trade war. Now there is a bullish technical pattern developing in the stock market. Let’s examine with the help of a chart. The chart shows the left shoulder, the head and the right shoulder. The chart shows the neckline. The chart is showing potential formation of an inverse head and shoulders pattern. This is bullish if the pattern actually forms. The pattern will be complete if the neckline is broken to the upside. 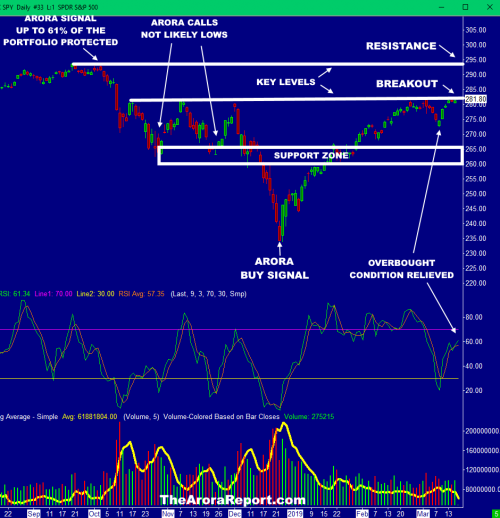 The chart also shows the resistance zone. The resistance zone is not that far away. 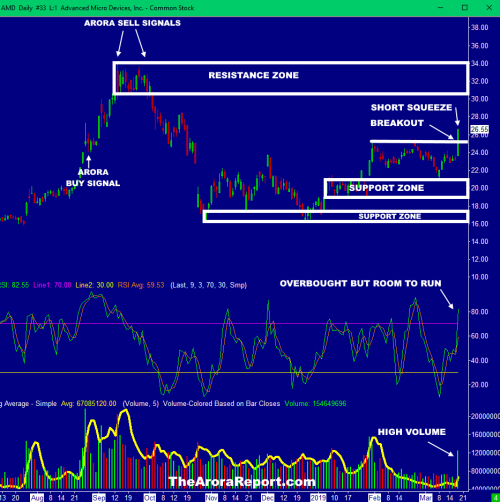 The chart also shows that RSI is entering the overbought region. So far the volume has not been what I would have liked for a long term sustained rally. The momo crowd is aggressively buying stocks in the early trade. The smart money is selectively and lightly buying. Gold is rallying on the weaker dollar. The momo crowd is aggressively buying gold. The smart money is inactive. Oil is rallying on Saudi and Russia coming together for potential production cuts. NBEV is buying Morinda. Morinda is a Utah based lifestyle and beverage company. The expectation is that CBD will soon be in the drinks from these companies. This is causing a lot of excitement. Our very, very short-term early stock market indicator is positive but it can easily give up some of the early gains. Gold futures are at $1237, silver futures are at $14.56, and oil futures are $53.40. S&P 500 resistance levels are 2840, 2860 and 2918; support levels are 2765, 2740 and 2700. DJIA futures are up 443 points. Looking ahead and not only in the rear view mirror, consider continuing to hold existing core portfolio positions. Based on individual risk preference, consider holding cash or treasury bills 21% – 31% and short to medium-term hedges of 10% – 15% and short term hedges of zero.